Anyone who has driven a car in the last month is aware of the horrendous condition of some of the streets and highways in our area. 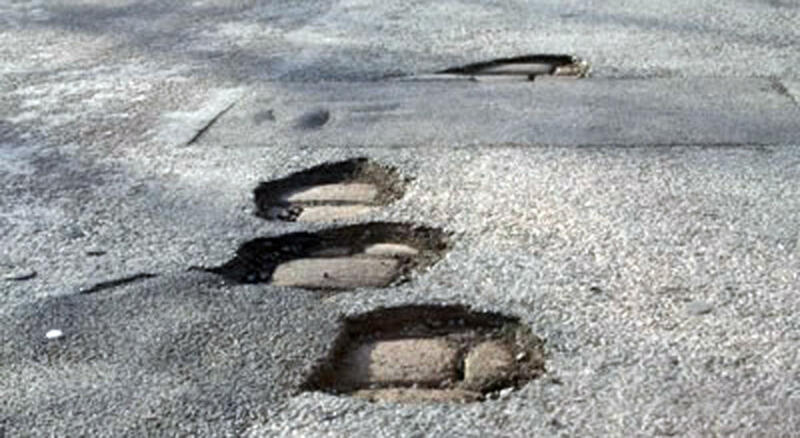 Potholes are created from cold and moisture. They’re everywhere, they’re unavoidable, and they can and do cause significant damage to tires, suspension systems, and other parts of cars. Even worse, you or your passengers can suffer a personal injury as a result of a pothole. Defects on sidewalks can arise as well, not only from cold weather, but also from sprawling tree roots, and just the natural deterioration of concrete over time. Pothole Damage - Who is Responsible? New York State and its municipalities – cities, counties, towns and villages – have laws that limit liability for both personal injury and property damage as a result of potholes. As one example, New York State, which owns and maintains state highways, is not responsible for damages caused between November 15 and May 1 – which of course is the very time of year when such damages are most likely to occur. That means that if you encounter a pothole and that pothole causes property damage – a ruined tire, a dented rim, or even worse, significant damage to the undercarriage of your vehicle – the State is not responsible for the damage. The same rule applies if that pothole causes an injury to you, or someone else in the vehicle. One bit of good news – if you have collision insurance, that might cover damage to your vehicle, assuming of course that the amount of the damage exceeds your deductible. Most municipalities have “Prior Written Notice” laws, which shield the municipality from liability for damages due to a road or sidewalk defect unless you are able to prove that the municipality received prior written notice of that defect, and then had a reasonable amount of time to repair the defect. However, many of these same municipalities have ordinances that require property owners to maintain the sidewalks in front of their premises, meaning keeping them clear of snow and ice, and defects in the concrete. Some, but not all of these ordinances permit a lawsuit against that property owner due to personal injury. For example, property owners in New York City are required to clear snow and ice from the sidewalk in front of their premises within four hours after the snow stops, not including the hours between 9PM and 7AM. Property owners are also required to maintain and repair the sidewalk in front of their premises, even if the defect is not their fault. There is an exception, though – if you own a one, two, or three family residential structure that is owner occupied in whole or part, and used only as a residence. Westchester County has dozens of separate cities, towns, and villages, each with its own Municipal Code, and each with its own laws regarding these issues. The law gets very confusing very quickly, and sometimes it seems as if the exceptions “eat up” the rule. Contact the White Plains Personal Injury Attorneys at Worby Groner Edelman if you’ve suffered an injury or property damage as a result of a pothole, or sidewalk defect. We have extensive experience in the area of municipal law, and can help sort out whatever situation you may encounter. We’ll handle all the details, make sure that a claim is made against the proper parties or entities, and process your case expeditiously. There’s never a fee unless we’re successful.